There are more than 1,000 different forms of martial arts scattered around the world and dating back more than 2,000 years ago. When the martial arts started and where no one really knows. In our western culture we can date the development of martial arts such as archery and wrestling to ancient Greece. However there is evidence that martial art training dates to Babylonian times. In the far east development of the Oriental martial arts is a bit more obscure. It is generally accepted that the martial arts developed its roots in ancient China among the monks who used weaponless fighting techniques to protect themselves. It is not known which type of unarmed techniques were used first, but it is clear that specialization was the custom. Combinations of different forms of fighting were unknown. Despite the ruling classes wanting to keep unarmed combat techniques secret, through commerce and migration, the martial arts spread from China throughout the east. The earliest chronicle concerning the martial arts is the Nihon Shoki which discusses Japanese wrestling and dates back to 720 AD. Since then, the martial arts have developed into a variety of systems that were the precursors of today's modern martial arts. Despite the development of many types of weaponry, unarmed combat remains a skill practiced all over the world. The origin of Japan's martial arts is vague, and what we know of it, is more legend than truth. However, the takenouchi-ryu martial art system founded in 1532 is considered the beginning of Japan's jujitsu forms. The system's founder taught jujitsu in a structured and methodical manner. For the next several hundred years, the martial arts were refined by Samurai who made a lifetime study of some twenty or thirty martial arts. Of these arts only one was based on weaponless self defense — jujitsu. By the mid-1800's more than 700 different jujitsu systems existed. The most popular were takenouchi-ryu, jikishin-ryu, kyushinryu, yoshin-ryu, mirua-ryu, sekiguchi-ryu, kito-ryu, and tenshin-shinyo-ryu; the last two were instrumental in Judo's development. It was during this time that Japanese politics disintegrated into disarray. Commodore Perry's visit to Japan in the mid-1850's also changed Japanese civilization by opening up a new world to them. In 1868 Imperial rule was restored (Meiji Restoration) and the decline of the Samurai class started along with a rapid decline in all martial arts. Although the government did not officially ban the martial arts, people were not encouraged to learn or practice them since the state was considered more important than the individual. Jujitsu literally fell into disuse. What was once the glory of the samurai was now looked down on and many well established jujitsu schools began to disappear. If the budo concept was to survive the Meiji Restoration, it had to change and become a tool to cultivate an individual and make him a better person for the good of all. As a result budo found a home in physical education and sport. Sport provided teamwork which was good for all and also developed the individual. It was a complete physical education; not just a game. Although self defense techniques were included in the training, emphasis was on using the techniques in a holistic manner. Dr. Jigoro Kano is credited with jujitsu's survival of the Meiji Restoration. He took jujitsu and adapted it to the times. His new methodology was called Judo. In 1882, Dr. Jigoro Kano (The Father of Judo) made a comprehensive study of these ancient self defense forms and integrated the best of these forms into a sport which is known as Kodokan Judo. In the seaside town of Mikage, near Kobe, Japan, Jigoro Kano was born on October 28, 1860. In 1871, Kano's family moved to Tokyo. As a boy, Kano was an undersized, slender, weak, and sickly child with one sickness after another. Against his doctor's advice, Kano decided to do something to improve his health and at the same time learn how to defend himself against bullies. At the age of 18 he enrolled in the Tenjin Shinyo ryu school of jujitsu. Under the guidance of Fukuda Hachinosuke, Kano began his long journey to physical well-being. The Tenjin Shinyo ryu was a soft martial art that stressed harmony rather than combat, yet at the same time included striking and grappling techniques. After studying at the Tenjin Shinyo ryu, Kano transferred to the Kito ryu school to study under Tsunetoshi Iikubo. This brand of jujitsu was much softer and stressed moderate workouts with attention given to freedom of action, the abstract symbolism connected with physical technique, and throwing techniques. It was during these times that Kano began a comprehensive and systematic study of other forms of jujitsu such as sekiguchi-ryu and seigo-ryu. He started this project out of respect for his masters, but he soon he craved for a mental knowledge that was lacking in their teachings. He sought to understand the superior control that his teachers had mastered. He also studied the manuscripts developed by the founders of various schools, the I Ching, (Book of Changes), and Lao-Tsze's philosophy. Around 1880 Kano started rethinking the jujitsu techniques he had learned. He saw that by combining the best techniques of various schools into one system he could create a physical education program that would embody mental and physical skill. In addition, he believed that the techniques could be practiced as a competitive sport if the more dangerous techniques were omitted. So in 1882, having pulled from ancient jujitsu the best of its throws and grappling techniques, added some of his own, and removed such dangerous techniques as foot and hand strikes. Kano at the age of 22, presented his new sport–Judo. He called this sport Kodokan Judo. The term Kodokan breaks down into ko (lecture, study, method), do (way or path), and kan (hall or place). Thus it means "a place to study the way." Similarly Judo breaks down into ju (gentle) and do (way or path) or "the gentle way." Kano established his Judo school, called the Kodokan, in the Eishoji Buddhist temple in Tokyo which grew in size and later moved. The first Kodokan had only 12 mats (12 feet by 18 feet), and nine students in the first year. Today the Kodokan has over 500 mats and more than a million visitors a year. Kano's devotion to Judo did not interfere with his academic progress. He pursued his study of literature, politics and political economy, and graduated from Tokyo Imperial University in 1881. In 1886, because of rivalry between jujitsu schools and Judo, a contest was held to determine the superior art. Kano's Judo students won the competition easily, thus establishing the superiority of Judo, its popular principles and its practical techniques. The categorization of Kodokan Judo was completed about 1887. The Kodokan had three broad aims: physical education, contest proficiency and mental training. Its structure as a martial art was such that it could be practiced as a competitive sport. Blows, kicks, certain joint locks, and other techniques too dangerous for competition, were taught only to the higher ranks. Starting in 1889 Kano left Japan to visit Europe and the U. S. He traveled abroad a eight times to teach Judo and several times to attend the Olympics and its committee meetings. Often in the face of extreme hardship, several of Kano's students devoted their lives to develop Judo in foreign countries. In 1892 Judo began to spread its wings across the world when Takashima Shidachi lectured the Japan Society in London on the history and development of Judo. In 1895 Kano classified the Judo throws into the Go Kyo No Waza. In 1900, the Kodokan Dan Grade Holders Association was established. On July 24, 1905, representatives of the leading jujitsu schools (ryu) of Japan, gathered at the Butokukai Institute in Kyoto to agree upon the forms of Kodokan Judo and to continue the development of the technical forms of the sport. The ancient jujitsu techniques of each particular school were to be preserved in kata (pre-arranged form) for posterity. In 1907, Gunji Koizumi arrived in the United States to teach Judo. By 1910 Judo was a recognized sport that could be safely engaged in and in 1911 it was adopted as a part of Japan's educational system. In the same year, the Kodokan Judo Instructors' Training Department, Kodokan Black Belt Association and Japan Athletic Association were formed. Beginning with the fifth Olympiad in Stockholm, Kano attended every Olympic Game and International Olympic Committee meeting and became a leading figure in international sport. 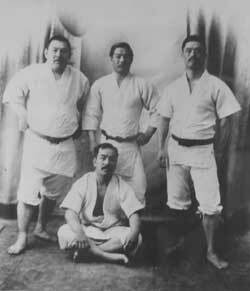 Kodokan Judo underwent an evaluation by its members in 1920. The Go Kyo No Waza was revised to include only 40 throws. Eight throws from the previous classification were discarded. In 1921 the Judo Medical Research Society was born. The Kodokan mottoes, Seriyoku-zenyo (maximum efficiency) and Jita-kyoei (mutual welfare and benefit), emphasize moral and spiritual training in addition to the physical training of Judo. The ultimate goal of Judo was to perfection the individual so that he can be of value to society. This spiritual phase developed gradually and was completed around 1922. In the same year the Kodokan Cultural Judo Society was established. In his lifetime, Kano attained a doctorate degree in Judo, a degree equivalent to the twelfth dan, awarded to the originator of Judo only. He constantly worked to ensure the development of athletics and Japanese sport in general, and as a result is often called the "Father of Japanese Sports." In 1935, he was awarded the Asahi prize for his outstanding contribution to the organizing of sport in Japan during his lifetime. While returning home from an IOC meeting in Cairo where he succeeded in having Tokyo nominated as a site for the 1940 Olympics, a lifetime devoted to Judo ended when Kano died of pneumonia aboard the S. S. Hikawa Maru on 4 May 1938, at the age of seventy-eight years . World War II saw a different development of Judo. Instead of being used for sport, Judo was being taught as a combat skill. Those selected for commando and special services training often achieved a high standard of expertise. When Japan hosted the 1964 Olympics, Judo was given its first opportunity as an event. Of the sixteen medals awarded for Judo, Japan won three gold medals, and one silver medal. Judo was no longer a Japanese sport but had developed to become an international sport. For more than sixty years the structure of Kodokan Judo had not changed. However in 1982 the Kodokan revised the Go Kyo No Waza by reintroducing the 8 techniques that were discarded in 1920 and by adding 17 new techniques. These sixty-five techniques became known as "The 65 Techniques of Kodokan Judo." There have been two main developments in Judo over the years. The first was the introduction of weight categories. In the early days, weight differences were not considered important. Everyone fought everyone else, with the result that, if two players were equally matched in skill, the bigger man usually won. There was much opposition to the introduction of weight categories. Some masters feared that it meant the end of Judo as a skillful art. Initially there were three categories, and later this was made into five. Inclusion of the sport in the Olympic Games in 1964 helped to hasten this important reform. The second development was the teaching of Judo to children. In the early days, it was thought much too dangerous to teach children because they would not have the self-discipline to avoid using it outside the club. Today many clubs are composed largely of junior membership. There are different styles of Judo. With its inclusion in the Olympics, there has been a shift toward a contest style practice. In clubs where this style is taught, practice becomes largely a continuous contest. Other schools stress skill. They favor repetitive movements to make them instinctive, and the development of speed through practice with little resistance. Such clubs usually also teach the kata,. Such clubs could be considered traditional Judo clubs. America's first introduction to Judo was in the late 1800's. In 1904, Yoshitsugu (Yoshiaki) Yamashita, one of Kano's students, traveled to the US and taught this Japanese sport to Theodore Roosevelt and West Point cadets. Although many local clubs and regional associations developed, attempts to organize Judo on a national basis were not successful. During the early 1930's Judo was taught at several colleges in California. In 1932 Kano lectured on Judo at the University of Southern California. In this same year four US Judo associations were formed and later became recognized by the Kodokan as representatives of American Judo. In 1949, Ruth Gardener became the first foreign female student to study at the Kodokan. Her objective in visiting Japan was to study for second degree black belt ranking. One of the first Japanese women to travel overseas to teach Judo was Keiko Fukuda, now 9th dan. She traveled to Australia and the Philippines, and settled in the United States to live. It was not until after World War II that American Judo began developing on a national basis. Many American servicemen studied Judo in Japan during the occupation and then returned home to teach it. As a result the Armed Forces Judo Association (AFJA) was established. American Judo received a further boost in the early 1950's when General Curtis Lamay required its teaching to US Air Force personnel in the Strategic Air Command. In 1953 Judo was officially recognized as an AAU sport and national tournaments have been held since. Kano made drastic changes in ancient jujitsu to suit the needs of his time; the acceptance of change is inherent in Judo. Everything about this martial art encourages us to make changes as required. In today's globalization of people and economy, Judo will undergo tremendous change. Its adaptability lends itself to the changing needs of society and the individual. Today Judo is enjoyed by more than 400,000 men, women and children. There are many reasons for learning Judo. Judo provides exercise, relaxation, sport, an interesting challenge, balance, coordination, self-protection and self-confidence. Judo offers a fellowship unlike other sports, and develops a keen desire to coordinate mind and body. One soon realizes that sheer weight, height, strength, and age are not the governing factors of one's ability. A gem cannot be polished without friction, nor man perfected without trials. The author of this page is Phil Rasmussen and it is provided here by Neil Ohlenkamp, Encino Judo Club, USA. Copyright © 1999/2003. Last modified August 11, 2003.